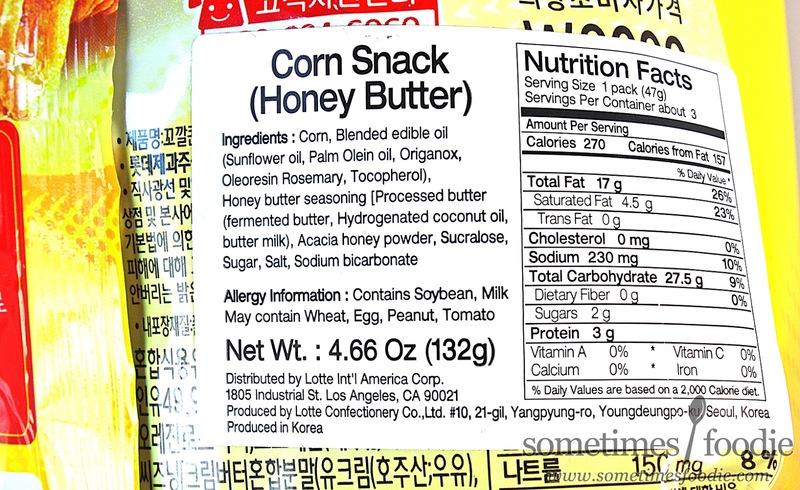 Honey Butter has become a hugely popular flavor combination for junk food in Korea. These snacks are rich and creamy, but salty, and they have a touch of honeyed sweetness, often paired with a crispy crunchy texture. Sounds great to me! This combination of sweet and savory isn't new, but I've never seen a product with that flavor profile become this popular! Was it effective K-pop viral marketing? Or does this stuff really taste as amazing as everyone says it does? Let's find out! Judging by the aisles of my local H-Mart, it looks like every Korean snack company is getting in on the trend. 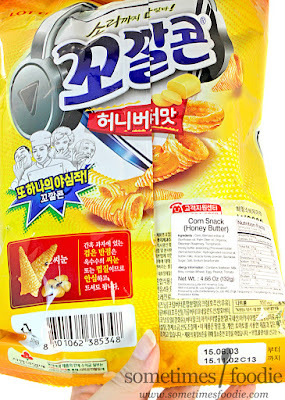 I saw honey butter chips, some kind of puffed 3-D triangles called Honey Tong Tong, snack sticks, and these Bugle-looking corn snacks. I ended up picking this bag over the others for two reasons. 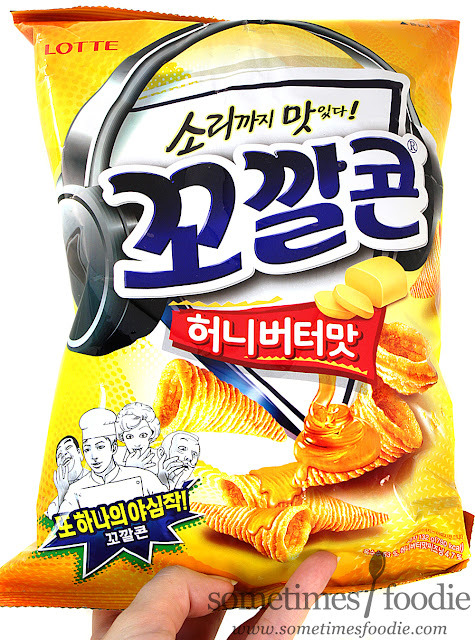 The first being that I haven't had Bugles or any similar cone-style snack in ages, and the second being the bizarre cartoon faces on the bag. What is going on here? There's some kind of chef-guy, a lady who looks like Audrey from Little Shop of Horrors, a very befuddled mustachioed man, and another guy maniacally laughing at his own hand? Are they all chefs or something? Who are these people? Are they parodies of celebrities? Should I know them from something? Why does the logo have headphones? I tried googling this stuff to find answers, but so far...I've got nothing. All of these mysteries aside, the packaging is pretty nice. 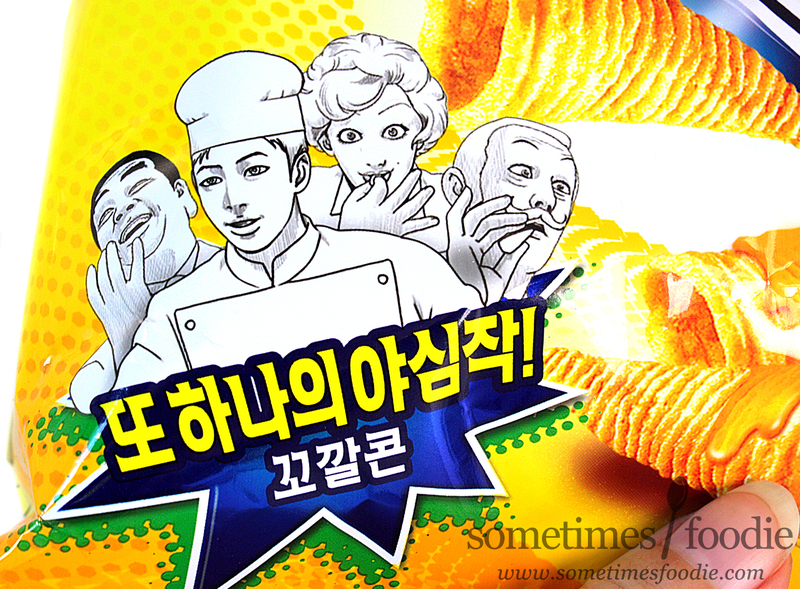 The bag has a rich honey-like orange-yellow gradient, the food imagery on the bag is appetizing, and the logo stands out. Everything is bold, without being obnoxious, and the primary(ish) color palette is very appealing. 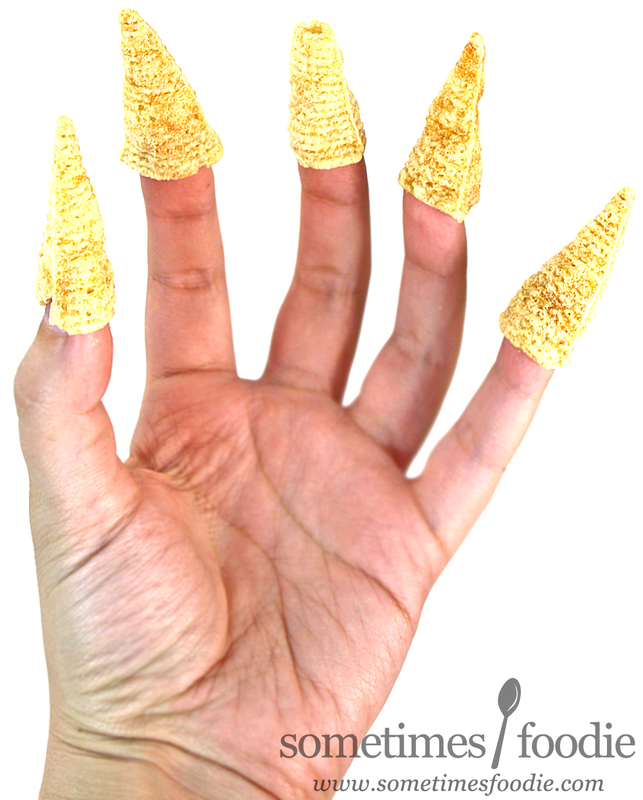 I couldn't resist, it's been ages since I ate anything shaped this way, so I immediately grabbed 5 cones and popped them onto my fingertips, which made me realize that these cones are likely too small for my now adult-sized hands. It took a bit of searching, but I finally found 5 that were big enough to fit my hand. Now that my inner child was satisfied, time to see if these are better than the dreaded Pringles attempt. Okay, these are definitely better than the Pringles version, and I get why they're so popular...it's because they're absolutely addicting! The crisp, but light, corn exterior is exactly like the Bugles I grew up with, which (again) is nothing new, but this flavoring/seasoning is perfectly balanced. 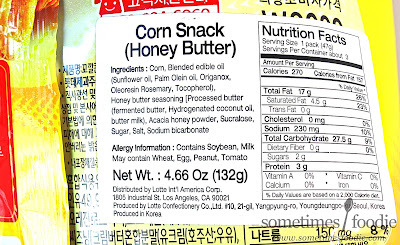 At first I can taste the slightly salty corn chip-like flavoring, but that is quickly mixed with a perfectly balanced sweet but savory butter flavoring. If any of you have ever had whipped honey butter spread (which was something I grew up with) imagine that, plus Bugles, but without all the mess of dipping. 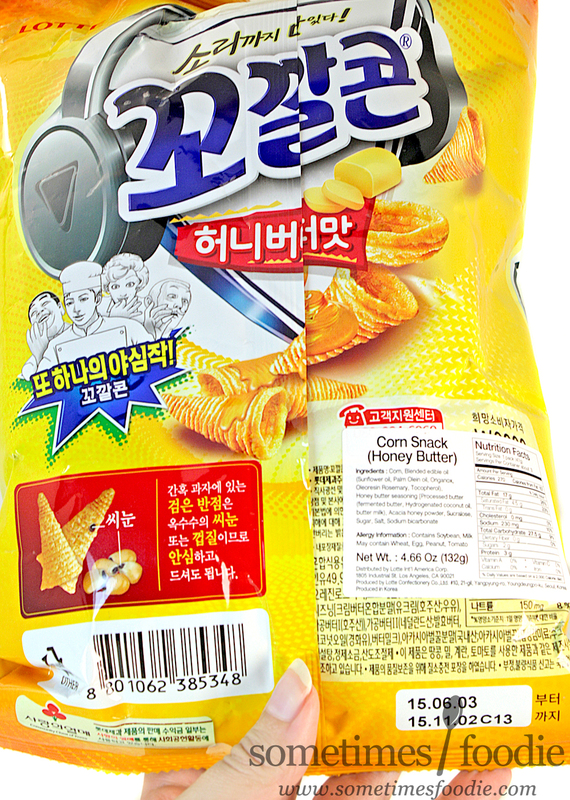 To be honest, these honey butter snacks weren't amazing or life changing, but they were addicting. We're talking edible crack. Once I opened the bag (and gave myself finger-cones) I kept eating these until I literally felt sick to my stomach, which is something I haven't done with junk food in a long time. I just couldn't stop! 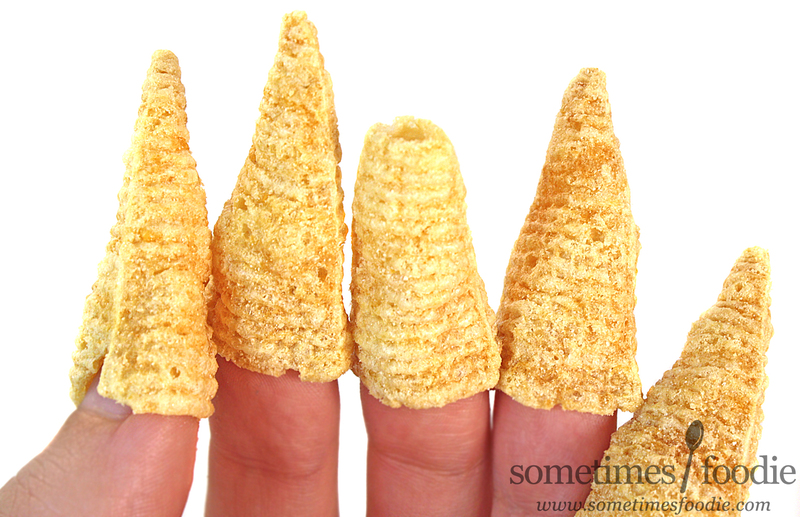 They satisfied my cravings for a salty snack, a sweet snack, and their crispy but light texture made it feel like I was eating nothing at all, which is why I kept shoveling them into my mouth. I think these are definitely worth checking out, but make sure you keep yourself in check, or the entire bag will be gone before you know it!